Nursery flooding has both short and long term consequences that are out of our control. During the fall of 2016 following Hurricane Matthew, numerous nurseries in eastern NC experienced flooding of both container and field nursery crops which resulted in millions of dollars of loss in infrastructure and plant material. To make matters worse, a few nurseries were also affected by flooding during a no-named storm event during spring of 2017. There are many resources related to flood tolerance of plants in nature or in the landscape but little reference to flood performance of container grown ornamentals. 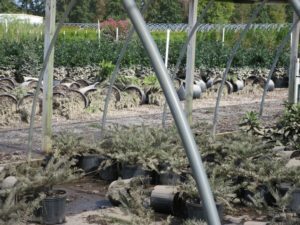 The following link will take you to the results of visual evaluations of container ornamentals (foliage, roots, and overall) conducted at these nurseries following these freshwater flooding events and compiled by Danny Lauderdale, Eastern Region Area Specialized Agent, Nursery and Greenhouse. Hopefully these evaluations and notes will help growers plan and prepare for future potential flooding events. Thanks to Dr. Anthony LeBude for reviewing this information.